I attended a lovely wedding in Jordan, Ontario yesterday. I had never heard of Jordan, so on Friday afternoon I hit Google after learning I was supposed to be at Cave Springs Vineyard for the wedding at 4pm. I Googled the vineyard and found the "how to find us" page on the Cave Spring Cellars official page. Then, I copied the address and pasted it into the destination field on Google Maps. Google Maps threw down direction that would get me there in 1 hour and 11 minutes, and I printed the directions and threw them in the car. I've highlighted the line that threw me. The locals will understand how I ended up going the wrong way. The QEW and 403 are the same highway for a stretch, and then one goes toward Niagara and the other goes toward London. 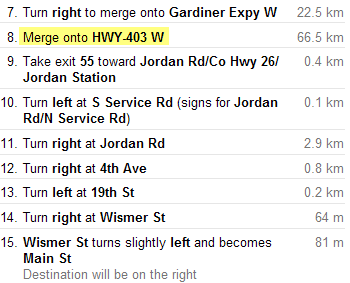 The instructions clearly said to merge onto HWY-403W, so that's exactly what I did, like a good Google soldier. Of course, when I hit Brantford, home of Wayne Gretzky, my spidey senses kicked in and told me I was off course. I missed the 4pm wedding, but I was early for the 5pm reception. Next time, I'll print the map along with the directions. We also could have re routed you on your way as that is the proximity to where my grandparents used to have their grape farm. You must have had quite a scenic drive from the Hamiltion mountainside to the beauiful landscape of Jordan and area.